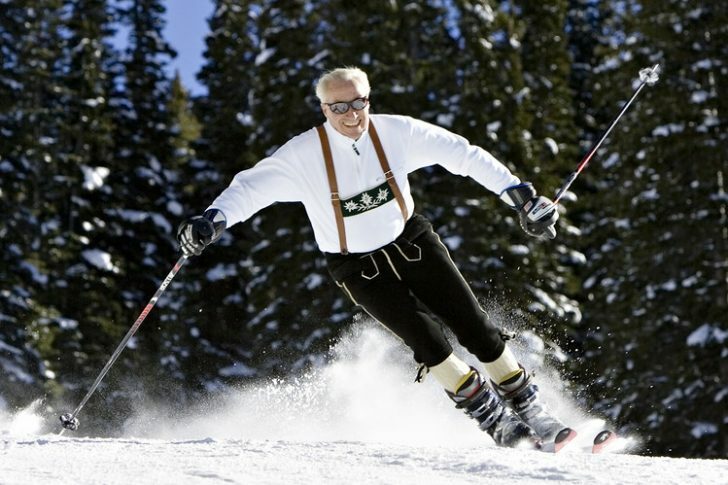 Klaus Obermeyer is a skiing legend and innovator. 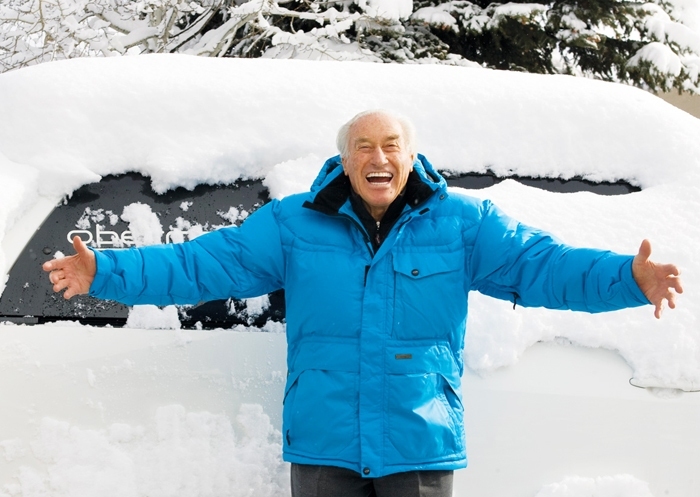 The 97 year old founded Sport Obermeyer Ltdbased on insights about ski wear while working in the late 40’s as an instructor in Aspen. One of his many innovations was the down ski parka, stitched together from a goose down comforter. Other product innovations include high-altitude suntan lotion, turtlenecks, nylon wind-shirts, and mirrored sunglasses. 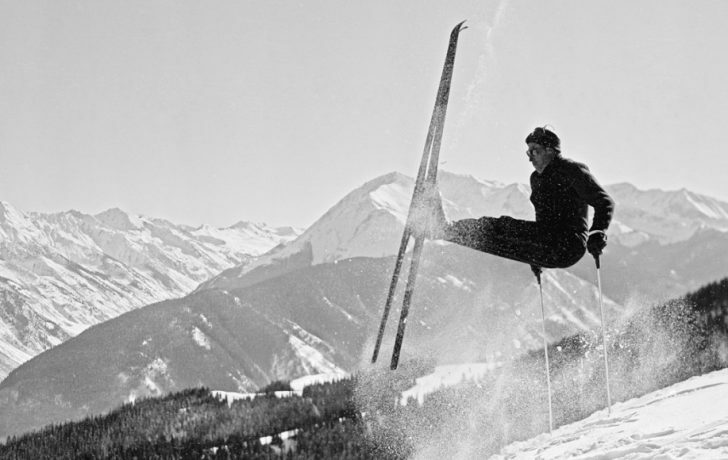 In 1961, the first Sport Obermeyer factory warehouse opened in Aspen, and innovations continued with “soft-shell” jackets, double lens goggles, pre-shaped gloves, the first waterproof, breathable fabrics, a built-in ski boot canting system and fashion-conscious, technically responsible skiwear. What are the most significant changes you have observed in the world of skiing? Skis have gotten shorter and wider. Their advantage is that you can float at lower speeds in deep snow. They make it easier for everyone to ski deep snow. They also allow those who climb mountains to use a lot more of the mountain with or without the lifts. During your time, which well-known skiers have had the most impact on ski fashion? 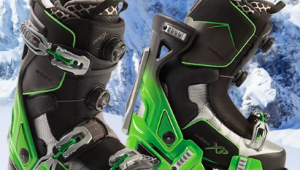 Please comment on the role of form and function in ski apparel? For many years, you have been a role model for older skiers. Do you think equipment and apparel manufacturers would benefit from using older models and showing older people in their advertising and marketing? The older models are slowly dying out and the young ones are tomorrow’s old ones. I think age makes no difference as far as technical performance of clothing. What advice would you give older skiers who are still healthy but thinking about hanging up their boards in favor of other activities? I think one should never give up skiing as it keeps the legs in good shape and even improves your walking after you’re over 80. 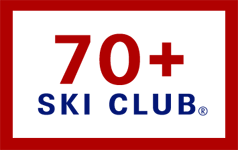 What advice would you give ski area operators to encourage older skiers to remain in the sport? Have parking places for older skiers so you don’t have to walk so far in those awful ski boots. Of all people past and present with whom would you like to ride the lift? With the best looking girl! Please add any comments not covered above. Skiing and boarding are sports that are absolutely unique and wonderful. The make you appreciate the incredible beauty of being outdoors in the mountains and give you tremendous choices of how fast to go, where to put your turns, and where to jump to get a zero G feeling. In the end it’s easier to ski than to walk. I totally agree with Klaus Obermeyer’s comment on never giving up skiing. I was about to do just that after my second hip replacement, but I remembered meeting a gentlemen on the slopes of Aspen Mountain who had both hips and both knees replaced and was still skiing. Skiing is my favorite thing to do in the world!!! I agree with you 100%. There is no greater feeling then gliding down the mountain over fresh powder. I had a knee replacement a year ago and I’ve never felt better. I’ve had the pleasure of skiing for over 60 yrs. One of my ski instructors at Chamonix, France was 74 yo and he was built like a 35 yo. That made me get in shape.